Slyde Show, developed by ProAidive Solutions, is a photo frame slideshow application for your iPad. Slyde Show allows you to connect with the whole world through photos. Just flip on the FlickR Photo Feed in the settings menu and you will start to see photos that are upload to FlickR in real time. You also have the ability to display your photostream or the pictures that are currently on your device. Unfortunately you have to choose one or the other because turning one on switches the other off. 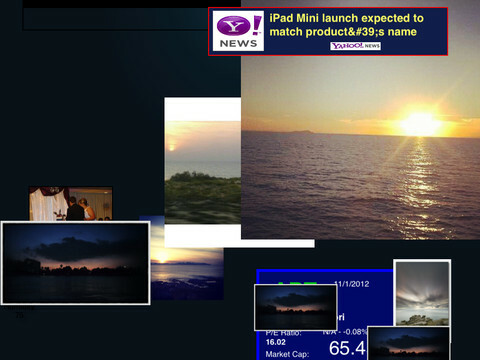 Not only can you have a picture slideshow running on your iPad, but you can also have live weather, stocks, and news. Slyde Show is unlike any other digital photo frame app in that the images are always up to date and current, rather than static. If you are in the mood for certain types of images, just imput them into the tags box and instantly get updated pictures based on the tags you type. Slyde Show is currently a FREE application for your iPad. It is available now on the Apple App Store. Go check it out today!